WASEL, is a VPN service provider with one of the most easy to use software client and reliable stable services, WASEL is your secure and safe gateway to the internet, By using our software and service you will be able to surf the internet anonymously and safely through high speed network of servers..
By using WASEL Pro VPN service, you can browse the Internet freely without any limitation, Make VOIP calls through Skype, and speed up your Internet connection by using advanced compression technique.. 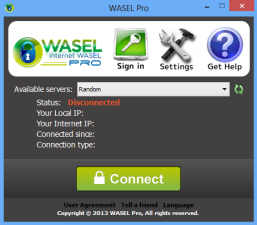 Using WASEL Pro service gives you the advantage of browsing the Internet anonymously and totally secured.. The tunnel established between your device and WASEL VPN servers is double encrypted and using top security measurment for secure and safe enviroment, Hackers will not have a chance getting to reach your device due to no show of your original IP address and the highly encrypted data transfer..
Easy installation and one click to connect application, just a setup our OpenVPN client on your device, insert your username and password and click connect.. Trusted & reliable VPN Solution for private and business use..
Several features (L2TP/OpenVPN), unlimited bandwidth, No restrictions over use, support all kind of VOIP. Compatible with all hand devices and cellphones, Applications for Android and iOS devices..
Access to multiple VPN servers, Unlike other services which provide you one account for one server, WASEL Pro gives you access to all servers with one account all the time..
Live help from our friendly customer support personals 24 hours 7 days a week, Remote assistance by Teamviewer for unusual issues..
No logging policy, Privacy is guaranteed.